Over 550 walkers and runners took to the Riverside Drive from Orleigh Park braving a somewhat chilly and windy May morning start. And it was all worth the while as the sun broke through and the tug-of-war and rock climbing got underway soon after the run. As for the breakfast, it certainly was worth getting up early for! 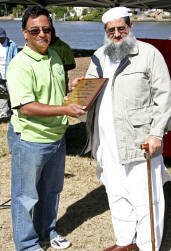 The Crescents of Brisbane Team presented Imam Yusuf Peer with the 2008 Special Achievement Award. The award was presented with these words of acknowledgment. At our staff meeting yesterday, IWAQ staff who participated gave feedback on the Creswalk event to other staff who were unable to participate and to this end IWAQ staff would like to congratulate CoB and say thank you for this event. 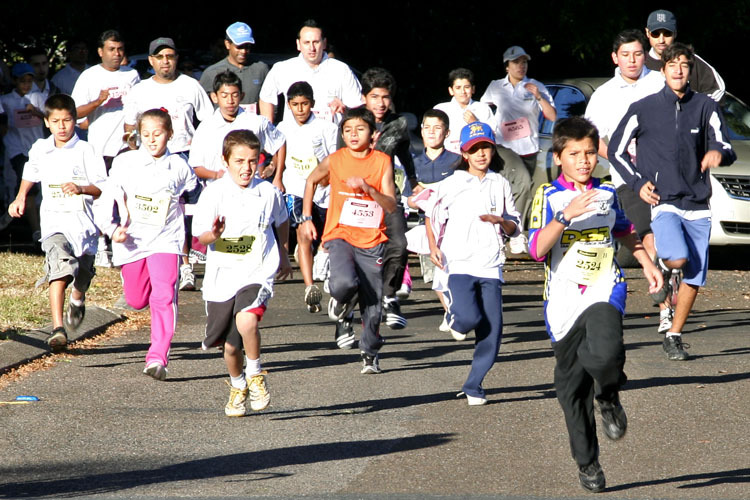 It was a very positive event to promote health and fitness. Due to prior commitment (operational planning following the strategic planning day where 25 staff and Management Committee were involved), a number of IWAQ staff could not come but some came back especially to participate. Thank you to all the team who organised the event. We very much enjoyed the morning and opportunity to speak with .... a large range of other people who attended. Congratulations on a wonderful and very well run (my pun of the morning) event. The walk itself was just too good! The guest speaker/runner - inspirational! It being my first one it was fun! The medals this year were "user friendly"